Kaiapoi Children's Day is an annual free event held on the first Sunday in March at Trousselot Park, Charles Street, Kaiapoi, to celebrate National Children's Day. This year's event will be held on Sunday 3 March 2019 between 12.00pm and 3.00pm. Children's Day is celebrated in many countries in the World and was initiated in 1999 with the first one being held in the year 2000. In New Zealand, it is a National Day, usually celebrated on the first Sunday in March. Kaiapoi Children's Day is an opportunity for the local community to come together to celebrate and treasure our children. Families are encouraged to come along and bring picnics, have fun and enjoy the multitude of family orientated entertainment and activities on offer at Kaiapoi Children’s Day. ​The Community Christmas Lunch began in 2010 initially as a response post-earthquake. 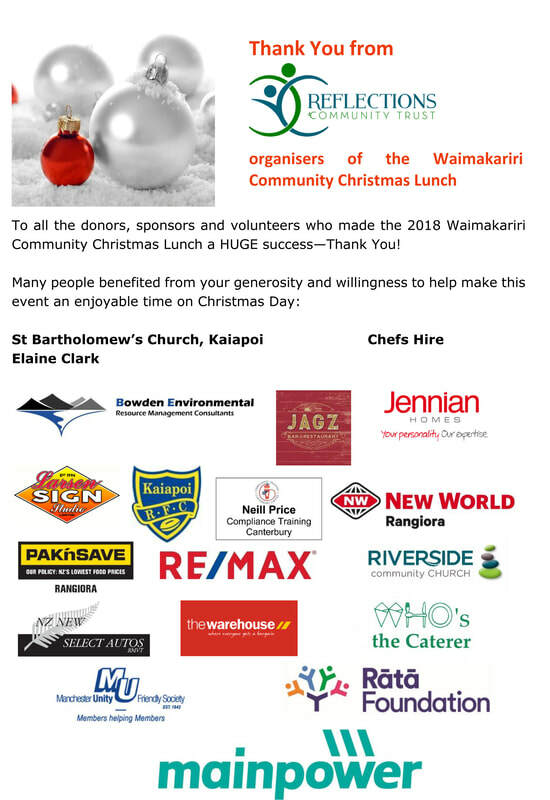 For the first three years, the Lunch was managed by Kaiapoi Community Support, with the Reflections Community Trust taking over in 2014. Held on Christmas Day at the Kaiapoi Rugby Football Club Rooms, Smith Street, Kaiapoi, the Community Christmas Lunch is an opportunity for people who may not have anyone to share Christmas with, or anywhere to spend Christmas, to come together, have a good time, make new friends or meet up with old friends and enjoy a special Christmas dinner in a cheerful and friendly atmosphere. ​Doors open at 11.30am. National Waimakariri MP Matt Doocey will open the event, followed by lunch served at midday. Christmas cake, tea and coffee will also be served. Santa will pay a visit to hand out Christmas presents to the children and a lollie scramble. will also be held. The event finishes at 2.30pm.